Recruits at MCRD Parris Island sit through classes during basic training June 26, 2015. —(USMC photo by Jennifer Schubert). New recruits have much to learn and, therefore, spend a great deal of time in the classroom during recruit training. Recruits in Marine Corps boot camp take classes covering subjects such as Customs and Courtesies, First Aid, Marine Corps History, USMC Mission and Organization, Terrorism Awareness, USMC Leadership, Official Policies and Organizational Values, and Operational Risk Management. For more information on some of these categories, see the sections below. New recruits are introduced to the customs and courtesies of the Marine Corps. They learn things that no Marine forgets. That the official motto of the Marine Corps, "Semper Fidelis" is Latin for "Always Faithful," and that it is sometimes abbreviated, "Semper Fi." 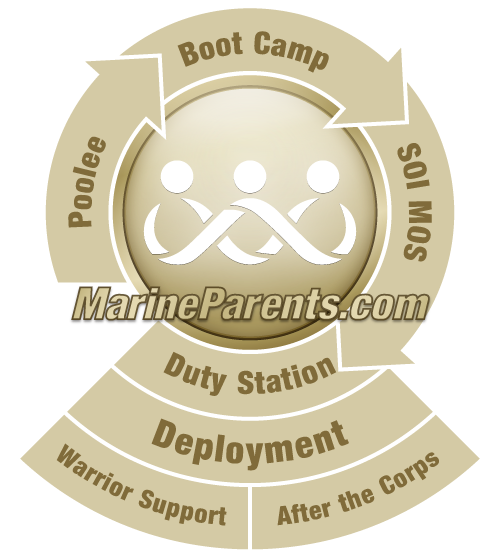 They learn to describe and state the significance of the Marine Corps emblem. They learn all three verses of the Marines Hymn. They also learn the background of the terms: Leatherneck, Devil Dog, and First to Fight. First Aid refers to the medical measures a Marine can carry out for him/herself or for his or her fellow Marines before emergency treatment can be provided by a corpsman or a doctor. Corpsmen and doctors can't be every place at once, and there may be a time when a Marine will have to depend upon his or her own knowledge to save his or her own life or that of a fellow Marine. Recruits learn and are tested on basic first aid tactics such as CPR, basic lifesaving steps, how to transport a casualty, how to stop bleeding, and how to identify poisonous animals and insects. The basis for being a Marine and contributing to its rich tradition is understanding how the Marine Corps came to be, what it has done, and why our history is so important to us. Recruits learn that since 1775, the United States Marine Corps has served honorably and proudly whenever and wherever our Nation has asked it to, and today's Marine Corps stands ready to continue in the proud tradition of those who so valiantly fought and died at Belleau Wood, Iwo Jima, the Chosin Reservoir, and Khe Sanh, among others. They learn that Marine history is replete with accounts of Marines who have shown exceptional bravery and made extraordinary sacrifices, and that, almost without exception, those accounts of heroism and service can be described by the words "Honor, Courage, and Commitment," -- the Marine Corps' core values. Those three words succinctly describe the reason Marines have always been looked upon as a fighting force without equal, capable of exceptional accomplishment in the face of insurmountable odds. During this class, instructors discuss the definition of terrorism, terrorism operations, and self-protection from terrorist attacks. Every Marine is, or will be, a leader at some point in his or her career, and leadership development begins early in the recruit process. Recruits will learn and practice the eleven Leadership Principles, such as "Know Yourself and Seek Self-Improvement," "Know Your Marines and Look Out For Their Welfare," and, "Set the Example." They will also learn and practice the fourteen Marine Corps Leadership Traits: Dependability, Bearing, Courage, Decisiveness, Endurance, Enthusiasm, Initiative, Integrity, Judgment, Justice, Knowledge, Tact, Unselfishness, and Loyalty.. Above information found on the Parris Island web site, August, 2009.